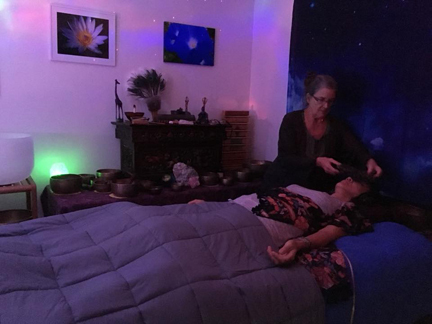 A Vibroacoustic Session is a full sensory experience in a peaceful healing room using gentle lights, frequency, music and live crystal and Tibetan bowls. My massage table has 4 speakers mounted under the table that play specially designed frequencies either alone or layered with sound healing music. There are two portable smaller speakers (pucks) that are placed on areas of the body of your choice -for example hips or feet. I also constructed a smaller portable unit with 4 puck speakers that can play a second layer of frequency and focus that energy where needed. I have headphones and eye covers for a deep immersion into the sound and relaxation, plus a full sound system for sonic immersion. The lighting are small units designed for kids to sleep and relax with. I do hands off shamanic reiki at intervals. A few people have asked for chakra balancing. Some want shamanic journey and do so, others have wanted deep relaxation. 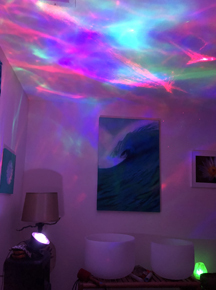 I have used this treatment room for clients with depression, anxiety, PTSD, and those seeking a general body, mind, emotion and spirit reset. The table and pucks plus the specially designed music focuses on deep relaxation and health enhancing energy. I work from the intention each client sets in selecting the music. Comfortable, loose clothing is recommended. Sessions are available for adults and children. Below are some of the ways we have used the table. A client J am under the care of a homeopathic doctor for intense detoxing and clearing of chronic fatigue. The layers of sound and music I use include immune system boosting and general heart opening relaxation. A client J – she has osteoporosis so we run both systems -one with the osteo frequency and another with music and relaxation. We are doing a series of weekly sessions to see if her numbers change when she goes back to the doctor. A client M is working on emotional release and healing of an injury from a fall -we also use both systems targeting the pain areas and the heart release relaxation. She is also working with my/our medical massage therapist on the fall. A client B has chronic back and shoulder pain – I have made a folder of focused back/shoulder frequencies for the pain release and play the general relaxation track of his choice. The sessions are either 30 minutes or 60 minutes and run $40 or $75. I also sell 4-packs for each at $145 or $275. I ask for intentions up front as that guides which music selection I make. A Sound Table has powerful low frequency speakers mounted on the bottom. The table itself acts like a speaker sending healing low frequency vibrations throughout every cell of your body. Sound tables are used in vibroacoustic therapies, which are treatment methods based on the combined effects of music and low frequency sound vibration. Auditory and vibratory stimulations are applied to the body to achieve physical and psychological results. Since the 1980’s, the use of vibroacoustic equipment has spread across the globe. It is used in a wide range of settings, including hospitals, hospices, spas, and centers for massage therapy, sound therapy, alternative health, yoga, physical therapy, and psychiatric treatment, and by individual therapists. Research from many hospitals and universities has proven the stress reduction benefits of listening to relaxing music. When using a sound lounge/table, music is not only heard through the ear, but delivered to the body directly, vibrating every part inside and out — cells, muscles, tendons, and organs, as well as nerves, spinal cord, and areas of the brain and brainstem. This opens the possibility of direct cellular stimulation and a deeper whole-body response. Sound tables transmit powerful, healing low frequencies through the body that are both relaxing and invigorating at the same time. Not only do they feel good, low frequency vibrations: • Penetrate every cell of your body, creating a relaxation response. • Send energy through each part of the body, energizing every cell leaving you invigorated. • Overcome the chaotic frequencies that attack our bodies throughout the day (noise, electricity, cell phones, traffic, etc. ), by creating a consistent vibration in each part of the body including all the organs. • Harmonize your body back into its natural consistent vibrational state, creating a peace that is natural to your system • Drive energy from cell to cell, clearing blockages and stimulating neural pathways.